What if your brain likes Ahmadinejad? OK, here we go again. Remember the fuzz about the Iacoboni lab at UCLA, where they used fMRI to probe into voters likes and dislikes of politicians? Now,a good article in the Atlantic.com gives us a 1st person story about the trip through the fMRI experiment, the thoughts and results following this scientific un-rigourous and invalid approach. Jeffrey Goldberg reports in a funny and entertaining manner how it all goes about. When I told my wife about this, she asked me how it could be that I hear her when she’s not speaking, but don’t hear her when she is speaking. I said that this was a question well beyond the capacity of neuroscience to answer. To newcomers and outsiders, it is crucial to understand that there is a substantial difference between studying brain activation related to specific behaviours and/or tasks, and to go the other way and interpret mental states or behaviour from brain activation patterns. The brain is much more than a collection of highly specialized regions, and there is considerable redundancy and degeneracy in the brain. This means that one structure can be involved in many different functions, and one function or state is often served by many different regions at any one time. So whether your brain responds with the amygdala to a particular face, compared to other faces, may not even mean that you fear or are concerned with this person. The amygdala may be involved in positive emotions, or even novelty processing. Brain-reading is a fascinating topic, but we should steer away from the absolute claims that one can sometimes see today. 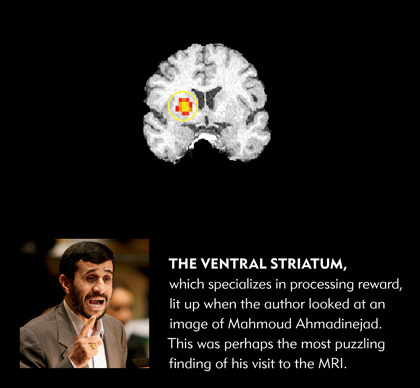 One good example, in the present article, of what this approach may lead to is the finding that the author showed ventral striatal activation to the Iranian political leader, Mahmoud Ahmadinejad. So ventral striatrum is related to (expectation of) reward, right. And previously, activation in that region to other famous people was interpreted as a liking-effect, right. Now what? Does Goldberg like Ahmadinejad? Will the NSA knock on Goldberg’s door in the near future? Is it illegal or suspicious for his brain to respond favourably to Ahmadinejad? This, and more puzzles are definitely going to come up in the near future, as Iacobini and other researchers are concinuing this flaky path of BS science. I’m a great fan of Iacoboni’s academic work, but I am nevertheless terribly dissapointed with his uncritical turn towards entertainment with fMRI. I think it’s pretty hilarious that Obama thinks he can talk Ahmadinejad down. It really shows some ignorance of there culture. I just read a really good article,Should The President of the United States Talk to Ahmadinejad? , that does a pretty good job explaining why this probably wouldn’t have great results.